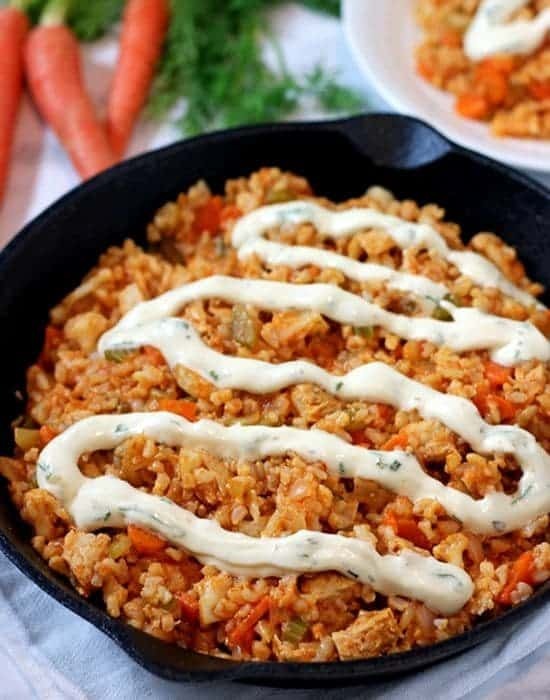 This Vegan Buffalo Chicken Rice Skillet is perfect for a football night dinner. 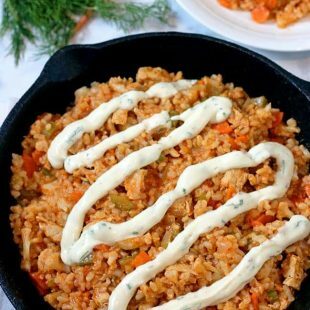 Vegan chick’n, brown rice and veggies are smothered in hot sauce and topped with ranch sauce for a tasty meal! I’m so obsessed with Buffalo anything – as you may have read in my Quinoa Buffalo Balls and Buffalo Chickpea Tacos posts. I just can’t get enough of that hot sauce taste! I’m a huge Miami Dolphins fan and every year I have such high hopes but they never seem to pan out. So for all of football season (and the Super Bowl if the Dolphins are not in it), I drown my sorrows in vegan food. This dinner is easy to prepare and perfect for game time. I used chick’n strips and added in lots of veggies and some brown rice to keep the dish nutritious – but don’t worry, you family won’t even realize! All of these ingredients are simmered in hot sauce and topped with ranch sauce to make my Vegan Buffalo Chicken Rice Skillet! When deciding on the veggies to add to my Buffalo Chicken Rice, my first choice was celery because it’s usually eaten with those flavors but let’s be honest, a little celery wasn’t cutting it. I also added carrots because they’re tasty and I felt like I needed one more veggie but couldn’t decide what it should be. I called my sister (because she’s my idea gal) and she recommended cauliflower. 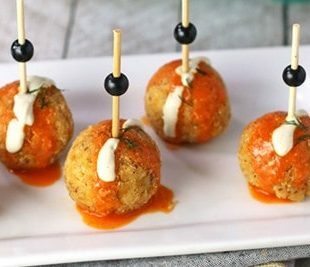 It was a great idea because it’s not an overwhelming flavor and can be cut into bite-sized pieces which would fit in with the recipe. For the ranch, I used the sauce from my Ranch Pasta Salad but the sauce from my Buffalo Quinoa Balls would work too (you might just need to add a little extra liquid). Meal Prep Tip: Make a big batch of brown rice the weekend (or day) before so you have the rice all ready to go for this tasty meal! If you make this vegan buffalo chicken rice recipe, let me know what you think by ★ star rating it and leaving a comment below. 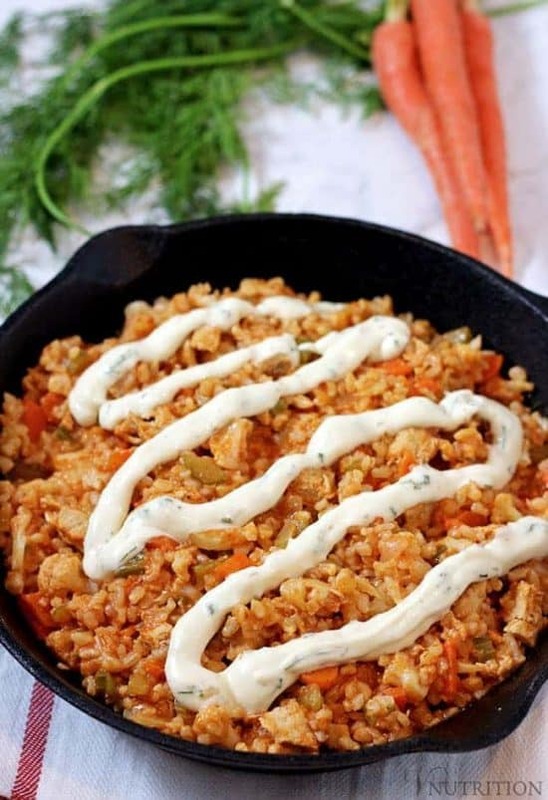 This Vegan Buffalo Chicken Rice Skillet is perfect for a football night dinner. 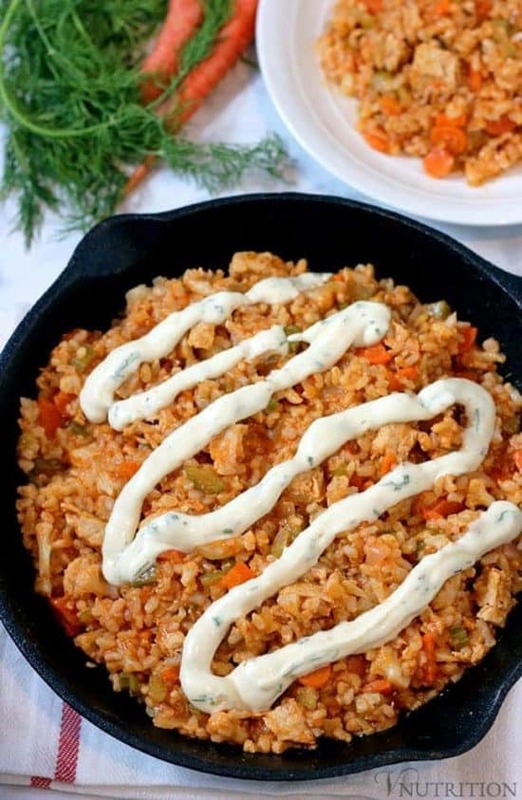 Vegan chick'n, brown rice and veggies are smothered in hot sauce and topped with ranch sauce for a tasty meal! Add oil, onion, and garlic to a large skillet/saute pan and cook about 3-5 minutes until onion is translucent. If using veggie broth instead of oil, add enough broth to just cover the bottom of the pan and add more if needed. Add carrots, celery, cauliflower and veggie broth and cook covered for 10-15 minutes or until veggies are cooked through. You may need to add more veggie broth or water while cooking, however there shouldn't be too much liquid left after the veggies are done otherwise the dish will be too wet. You want a little coating on the bottom of the pan but if there's too much liquid once the veggies are finished cooking, pour a little out. Add rice, chick'n, tomato sauce, hot sauce, nutritional yeast and cook for about 3 minutes or until all ingredients are heated through. Top with some ranch sauce and serve! *Nutritional information does not contain ranch sauce. Like my Vegan Buffalo Chicken Rice recipe? 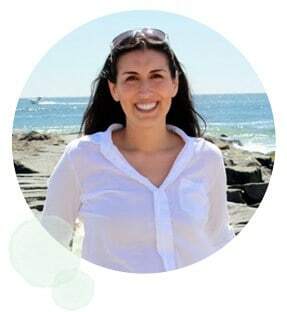 It would be so wonderful if you could give it some love by sharing! I’m all about the buffalo sauce too! I love that you’ve managed to move it outside of appetizers and straight into entrees. I would be all over this! Thanks so much Cadry! Buffalo sauce is my weakness! Wow, this is great idea and one i would not had even considered. A fab way to use red hot sauce too. I would love this for my working lunch. Yum cauliflower was def the right choice! I’m such a fan of buffalo flavor, so this is right up my alley! YUM! Yes, so glad I listened to my sister! The cauliflower has the same texture as the rice so it works well. Thanks so much Julie! I love anything buffalo flavored! That tangy heat – yum! Perfect for game day!! Thank you so much Jenn! Vegan buffalo anything is my favorite! Haha, we’re so a like in so many things except sports! Yes, you relax and have Terry make it for you! Not too hot, I know you don’t like things too spicy! Looks fabulous, Mary Ellen! I love Frank’s Red Hot with Ranch. 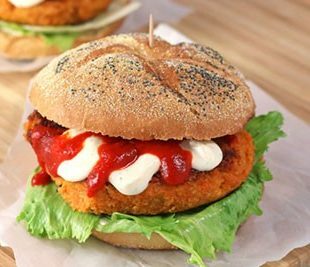 Yes, the buffalo sauce is an acquired taste – especially for those outside the US. Every year I hope for my team to do better and every year they disappoint me! This looks wonderful and agreed, love that it’s in a main dish. Must try soon, thanks! I love buffalo sauce and this is such a great way to use it. It would be perfect with a nice cold beer! Ooh yes, next time I make this I’m busting open a nice cold beer! I’d love to! Can I sneak hot sauces into Canada? Ranch anything is my favorite! I love this and cannot wait to try! Happy Meatless Monday! Thanks Sarah! Happy belated Meatless Monday! 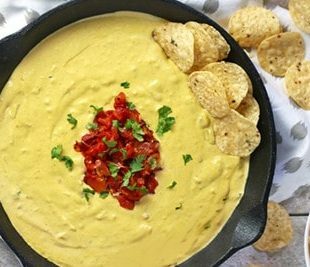 This is such a fabulous recipe for game day! Looks so satisfying and spicy 🙂 I’m obsessed with buffalo sauce too! It’s so darn addicting. Thanks so much Melissa! Buffalo sauce is my favorite! I love all in one dinners, and I love buffalo sauce so this meal is a dream for me. XD I’ve been craving veggies lately (because they are lacking in my diet sadly) so this hopefully will get made soon in my house. This recipe is so delicious. It is really hard to find vegetarian meal options that are easy to put together and come together so fast. The bonus is that my kids loved it as much as my husband and I. It is flavorful, fun and most importantly combines tons of healthy ingredients to leave you feeling satisfied!